« County Fire: Working smoke alarms save lives! The San Bernardino County Regional Parks Department is excited to host their Spooktacular Food Truck Festival on Sunday, October 19, 2014 in celebration of Halloween and the arrival of fall. 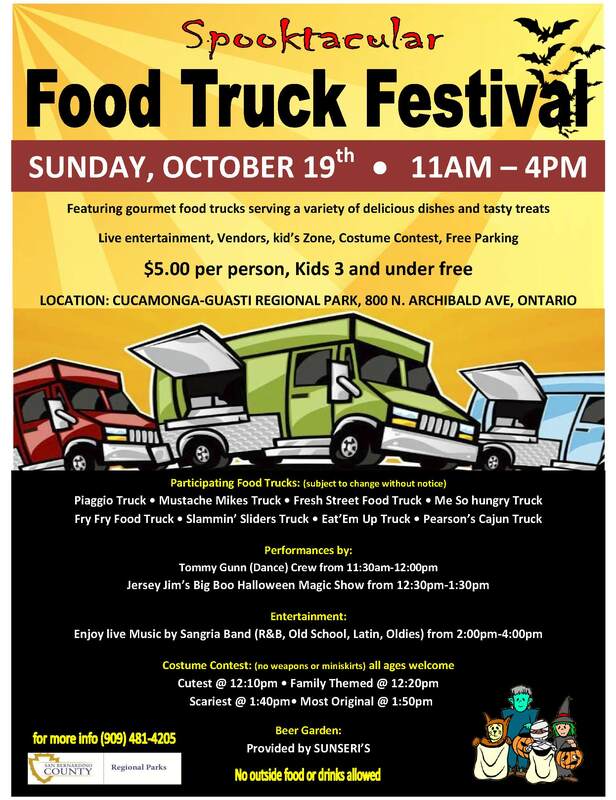 The event will be held at Cucamonga-Guasti Regional Park in Ontario, from 11 a.m. to 4 p.m.
Get your grub on with an array of trucks including the Piaggio Truck, Slammin’ Sliders, Me So Hungry, and more. Participate in costume contests, and enjoy live entertainment from Jersey Jim’s Big Boo Halloween Magic show and the Tommy Gunn Dance Crew.